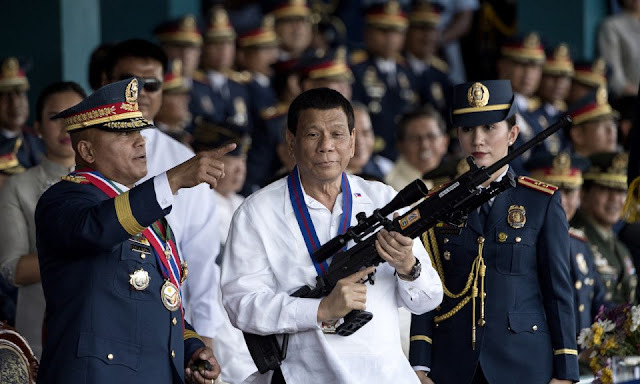 MANILA -- President Rodrigo R. Duterte has high hopes that the government is “winning the war” against the New People’s Army (NPA), noting that many of the rebels have started laying down their arms. “I think we are winning the war finally. Maraming front sa Mindanao bumagsak na, especially on the right side, eastern --- Davao, Agusan (There are many front in Mindanao that have collapsed),” Duterte said in his speech in Malacañang on Wednesday. “I think that kung maawa ang Panginoong Diyos (if God will be merciful), this will be over by about the second quarter of next year. Ang rami na kasi nagsu-surrender (There are many of them surrendering),” he added. Duterte said he knew all of these from intelligence personnel who have information about communist rebels and leaders who have surrendered. The President earlier reached out to Communist Party of the Philippines founding chairman Jose Maria Sison to return home and talk peace. However, there was a stalemate in the talks because Sison wanted a coalition government. Duterte said he was still open to the resumption of peace talks but Sison had to comply with his conditions--for the peace talks to be held in the Philippines, for the rebels to stop collecting revolutionary taxes, and for hostilities to cease, among others.